Remy Charlip's (January 10, 1929 – August 14, 2012) background in theater, dance and education combined for a winning knack in creating captivating children's books. He won numerous awards for his work in all these fields, including the Horn Book Award, Bologna Book Fair Award, and The New York Times "10 Best Illustrated Books of the Year" for three consecutive years. 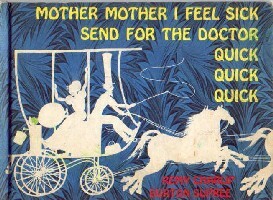 While Charlip may be more famous in the book world for classics such as Thirteen, Fortunately, and Arm in Arm, the request we receive most often is for Mother Mother I Feel Sick Send for the Doctor Quick Quick Quick. Its silhouette illustrations trigger young imaginations and its simple humor is right on target with young readers, especially memorable years after those readers have grown up and had children of their own. The new reprint features new textured backgrounds and scenography behind the silhouettes, and a couple new color contrasts too. It's quite effective. * Arm in Arm. Parents Magazine Press, 1969. Dress Up and Let's Have a Party. Young Scott Books, 1956. * Fortunately. Simon & Schuster, 1964. Handtalk: An ABC of Fingerspelling and Sign Language. with Mary Beth, and photographs by George Ancona. Simon & Schuster, 1974. Handtalk: A Number and Story Book in Sign Language. with Mary Beth and photographs by George Ancona. Simon & Schuster, 1987. Harlequin and the Gift of Many Colors. with Burton Supree. Parents' Magazine Press, 1973. * Hooray For Me! with Lilian Moore, illustrated by Vera B. Williams. Tricycle Press, 1975, 1996. I Love You. Scholastic Books, 1967. Ideas for Teaching Arts to Children. San Francisco Arts Education Project, 1995. It Looks Like Snow. Young Scott Books, 1962. Jumping Beans with Judith Martin. 1963. * Little Old Big Beard and Big Young Little Beard. Marshall Cavendish, 2006. * Mother Mother I Feel Sick Send for the Doctor Quick Quick Quick. with Burton Supree. Parents Magazine Press, 1966. Peanut Butter Party. Tricycle Press; 1999. * A Perfect Day. Harper Collins, 2007. * Sleepytime Rhyme. Greenwillow, 1999. Thirteen. with Jerry Joyner. Parent's Magazine Press, 1975. The Tree Angel. with Judith Martin. Alfred A. Knopf, 1962. What Good Luck What Bad Luck. 1969. What Is the World? with Betty Miles. Knopf, 1958. Where is Everybody? Young Scott Books, 1957. Why I Will Never Ever Ever Ever Have Enough Time to Read This Book. Illustrated by Jon Muth. Tricycle Press, 2000. The Curious Little Kitten. by Bernadine Cook. Young Scott Books, 1956. David's Little Indian. by Margaret Wise Brown. Disney Book Publishing, 1956. A Day of Summer. by Betty Miles. Alfred A. Knopf, 1960. A Day of Winter. by Betty Miles. Alfred A. Knopf, 1961. The Dead Bird. by Margaret Wise Brown. Harper Collins, 1958. Four Fur Feet. by Margaret Wise Brown. Young Scott Books, 1961. A Moon or a Button. by Ruth Krauss. Harper Brothers, 1959. My Very Own Special Particular Private and Personal Cat. by Sandol Stoddard Warburg. Houghton Mifflin, 1963. The Seeing Stick. by Jane Yolen. Harper Collins, 1977. What a Fine Day For… by Ruth Krauss. Harper and Row, 1967. What is the World? by Betty Miles. Alfred A. Knopf, 1958.